Do Jews Kneel in Prayer? I was given no formal education of my Jewish heritage, but I’m told that Jews are instructed not to kneel when we worship. Is this correct? If so, what is this instruction about? Throughout the Bible, we find bowing and kneeling as part of prayer, and this was indeed the practice in the Holy Temple in Jerusalem. There are several reasons, however, why we do not kneel when we worship today. 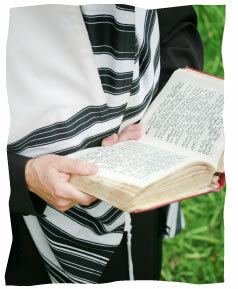 However, the Code of Jewish Law states that if you put an intervening substance between your knees and the stone floor, then it is permitted to kneel.2 Therefore, on Yom Kippur, when we do kneel and bow down with our faces to the floor, people bring towels to kneel on, since many synagogues (especially in Israel) have stone or tile floors. When it comes to daily prayers, however, we are concerned about transgressing this prohibition and therefore do not kneel in prayer. The only exception to this was kneeling on the floor in the Holy Temple. Shulchan Aruch Harav 131:1 (vol. 1, p. 383, in the Kehot edition of 2001). I Prayed to Lose Weight, Why Am I Still Fat? A Blessing for a Lunar or Solar Eclipse? Do I Say Kaddish Again? Can I Pray With an iPhone? I was taught that in accordance with Sefer Yetzirah, that as the world was created with 32 utterances of Elokim, we as minority partners in creation, are connecting with that energy when the human spine (which is composed of thirty-two vertebrae) is straightened (as we straighten the world by putting holiness into the mundane). Thus our vertebrae must be straight when we say the shema. As well, the pronounciation of echad as "echadth" (Yeminite), we also properly align the 32 teeth we have. Thus, as I was taught, extending our days by extending the echa"dth" (Berachot 13b). Moreover, since when have we Jews lacked the emunah to act in a manner consistent with the presumption our prayers will be accepted? Is this not in great portion the very "Joy of Yom Kippur"? Daniel כָּל-קֳבֵל, דְּנָה--מַלְכָּא, דָּרְיָוֶשׁ, רְשַׁם כְּתָבָא, וֶאֱסָרָא. 10 Wherefore king Darius signed the writing and the interdict. Re: Anonymous and Joe Anon: I'd argue that King Solomon had good reason to be certain that his prayers would be answered. He was, after all, a wise and righteous man, and leader of the entire nation! Prostrating as Jews use to do. I think that by Mohamed's time, Jews used to prostrate, but for some extreme thoughts by some Rabbis, made the Jews stop prostrating. That's one of the reasons the Koran is prohibited from any translation. Prostrating to G-d, should be normal practice for all humanity that believes in the Thereafter. Kneeling in churches is wrong, NOT because kneeling is non-Jewish, but because kneeling in worship of Jesus is not Jewish. Non-Jews also stand in prayer. Should we therefore abstain from standing during prayer? Muslims abstain from pork -- should we therefore eat pork? “an intervening substance between your knees “ What does that mean? Sorry I am not familiar with this procedure. Kneeling while praying seems to me acknowledging guilt from the person like asking for forgiveness of something. It is very condescending and non-Jewish practice. Praying should be recognizing G-d’s existence by thanking him for all the mercies he bestows upon us and ask for the safeguard of human being’s lives on earth or even for a personal favor. It should not be a punishment as kneeling seems like.